McGregor Mountain Lodge Blog: Brat! 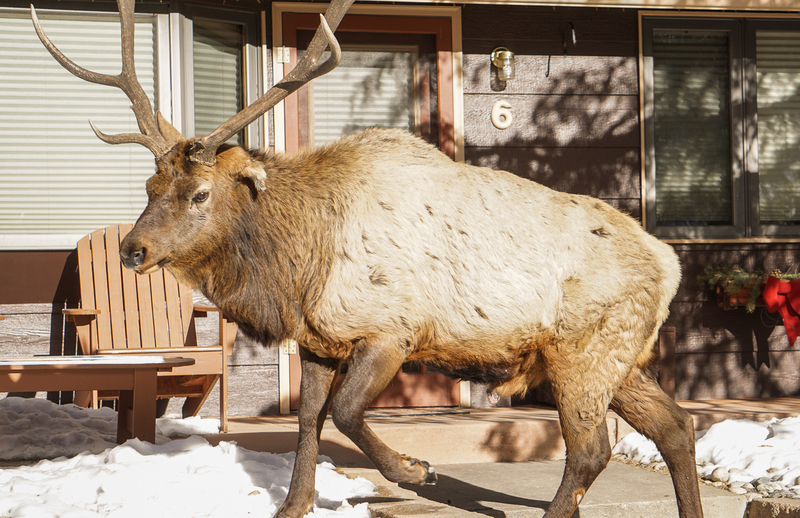 As you may know, we host one of the most famous elk to ever walk the Estes Valley. 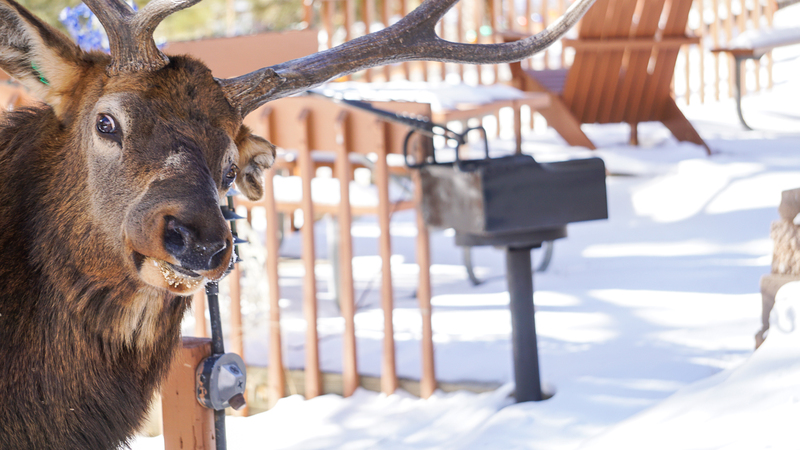 With the exception of Samson, Brat is the biggest "Elk Star" in Estes Park history. He's had his own section of the local paper, he is sought out by guests not even staying at the lodge, and he's had bloggers and newspapers across the country write stories about him. He showed up about 8 years ago as a majestic bull in his prime. We've seen him every year since. He shows up on the property between the end of October and the end of November, and stays with us, for the most part, until the grass begins greening in May/June. The past few years he has been on a slow decline, for lack of a better word. It's just obvious that he's getting older. 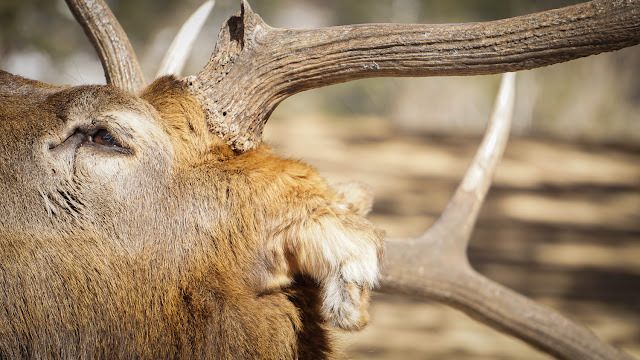 He bows out of the rutting festivities earlier and earlier each year, some years he's returned with some gruesome injuries, and his rack has been getting smaller for the past three years. Guessing that he was 7 years old, give or take, when he first arrived, that would put him around 15 years old this year, which is quite old for a wild elk. Their average life span is 10-13 years. 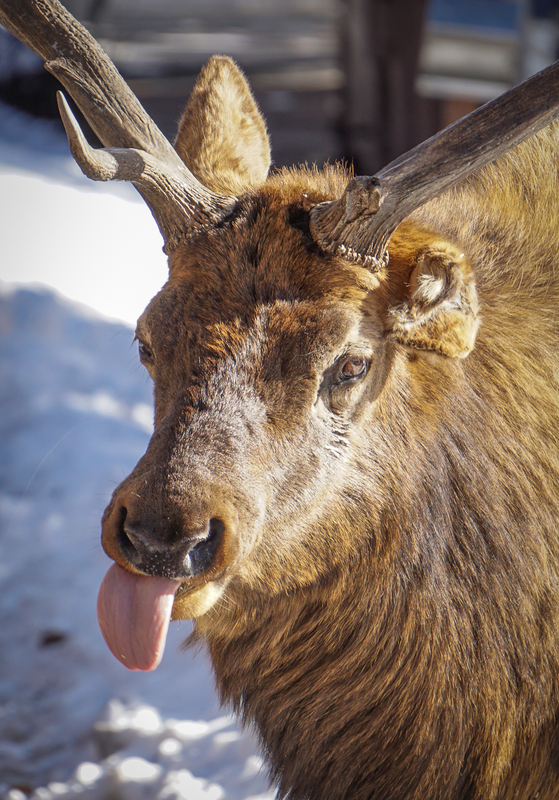 But without any real natural predators and being protected from hunting in the National Park, the elk here can live a bit longer than their species' average life span. You can usually find Brat lounging on our mountainside, sometimes directly in front of a cabins door! While he seems to be a gentle giant, we always respect his size, speed, and strength and give him plenty of room. Occasionally, he'll live up to his name and get quite ornery with us and/or guests. A few signs that you're *way* too close: Lowered head, curled (snarled) lip, teeth grinding, hissing, and other vocalizations. He's pretty good about giving subtle clues when he's unhappy. But as a rule, just give him, and all wild animals, a wide berth. Brat is easy to identify with his mangled left ear. An injury afflicted during the rut a few years ago. Many ask how he got his name. When he first arrived, he wasn't the dominant bull on the property. We had another beloved "resident" named Lefty who was a massive bull and ruled the property. Brat played 2nd fiddle for sure and had to get when the getting was good. Brat knew he was bigger than us, so when Lefty would run him off of the bird feeders, Brat would follow Steve around in the golf cart and eat birdseed out of the back of the golf cart. We couldn't shoo him away if we wanted to! Brat must have been on edge when Lefty ruled the roost as he could be quite aggressive with us. There were several time we had to run him off the property with a vehicle. But over the years, and after Lefty failed to return one year, Brat settled into his role as the dominant bull in the valley. This must have given him a bit of comfort as we really calmed down and made himself at home on the property. He was no longer a nuisance, and became a wonderful addition to our regular wildlife visitors which included Mama (a mule deer who would bring her fawns by every spring), Tippy (a beautiful red fox and her kits), and Shadow (another beautiful mulie). So here we are. Brat is most likely in his final couple of years with us and the new generation is patiently waiting. Many of you know Sven as well. He is a younger bull just hitting his prime. Massive wide rack, healthy coat, quick and agile steps. While we hope to have Brat around for years to come, we are sure happy to see Sven settling into his role here at the lodge. If you happen to be in Estes Park, and not staying at McGregor (why in the world would you stay anywhere else ;) be sure to swing by and say hi to our resident elk and one of Estes Park's most famous residents.